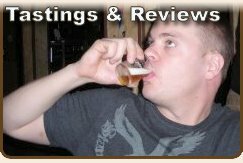 Welcome to review number 2, featuring Wild Dog's Barrel-Aged Horn Dog, another fine beverage provided by Flying Dog Brewery for my reviewing purposes. The great thing is, you can only get this treat straight from the source. 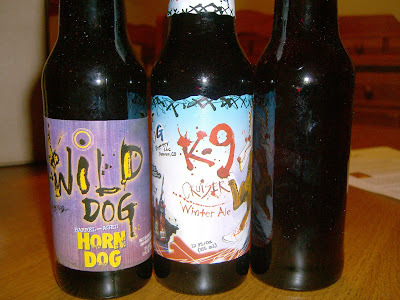 But thanks to the generous folks from Flying Dog, I got to sample it without flying all the way out to Colorado. Thanks again! My buddy Dave was kind enough to assist me with his own review offering a second opinion. Some words from Flying Dog: This is a completely experimental beer. We took our Horn Dog Barley Wine and aged it in used Stranahan's Colorado Whiskey barrels for 13 months to give us a BarleyWine with a very distinctive flavor. Being that it was an experiment, we brewed a very limited amount (725 12oz bottles to be exact) and they can only be purchased at the brewery. Style Description from our friends at BeerAdvocate.com: Despite its name, a Barleywine (or Barley Wine) is very much a beer, albeit a very strong and often intense beer! In fact, it's one of the strongest of the beer styles. Lively and fruity, sometimes sweet, sometimes bittersweet, but always alcoholic. A brew of this strength and complexity can be a challenge to the palate. Expect anything from an amber to dark brown colored beer, with aromas ranging from intense fruits to intense hops. Body is typically thick, alcohol will definitely be perceived, and flavors can range from dominant fruits to palate smacking, resiny hops. 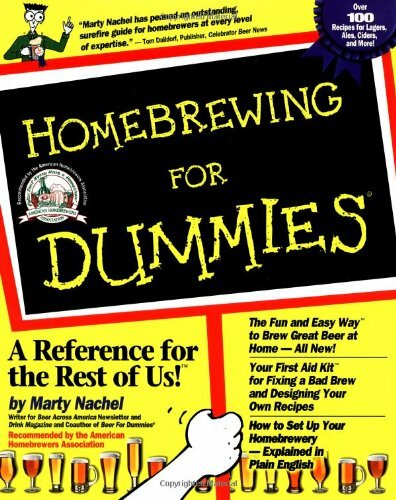 English varieties are quite different from the American efforts, what sets them apart is usually the American versions are insanely hopped to make for a more bitter and hop flavored brew, typically using American high alpha oil hops. English version tend to be more rounded and balanced between malt and hops, with a slightly lower alcohol content, though this is not always the case. 1. Appearance - Now here is a thick looking beer. Cloudy, dark brown, like a pint glass full of black coffee, with almost no head to speak of. 3. Taste - Wine meets coffee with undertones of chocolate (and raspberry?)... Very rich... An almost Jägermeister-like thick and sweet quality. This is a really good dessert beer, reminds me of cheap wine with chocolate and strawberries, but in a good way. Don't ask, it's a college flashback... I can also taste hints of oak, undoubtedly a result of the barrel aging process. 4. Mouthfeel - A heavy but smooth drink. Very lightly carbonated. 5. Drinkability - An interesting drink, but just too sweet for me to have more than 1 or 2 at a clip. But at 10% abv, that's probably a good thing. In my mind, this is a sipping beer, or as stated before, a dessert beer. Something good for a cold winter night, while you sit by the fire. Now don't get me wrong, this is a good beer. My aversion to more than 2 is more about the style than the beer itself. This begs the question, "What does drinkability mean to you?" If you're looking for a beer that you'd have many of in one sitting, you're probably looking for a session beer, as good as this beer is, it's no session beer. Think of it as more of a special treat. 1. Appearance - The beer is unique looking; thick as mud with no head and a color like moist coffee grounds. It's both inviting and intimidating. 2. Smell - There's a lot going on here, and it's all good. First impressions are coffee and red wine smells, and chocolate shows up in there as well. The background presents roasted, malty smells and is very inviting. 3. Taste - The taste is amazing and complex. It presents as a well aged tawny port, with hints of winter spice, coffee, and chocolate. Nutty and toasty, this is not a 'six pack beer' you can finish in one sitting. 4. Mouthfeel - Letting the beer wander allows the hint of alcohol to sneak through. horn Dog is smooth and heavy, with little to no carbonation, but the lack there of, does not leave one wanting. 5. 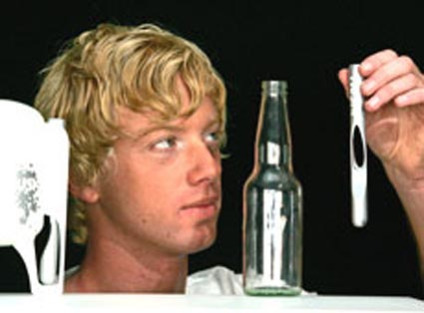 Drinkability - The beer is very drinkable, but not in large quantities or consistently. I recommend everyone try one as this beer is delicious and I hope to have it again. And now two quick reviews (and one real quick video review) of the Wee Heavy I purchased while touring the Custom BrewCrafters brewery in upstate New York with my family right before Thanksgiving. For this beer, I had a little help from Dave, who offered his own second opinion, and Kenn who made time for a brief video review. Scotch Ales are strong ales, also known as "Wee Heavy." In the 19th century Scotland, they'd also be known as 160/-, a nomenclature based on the now obsolete shilling currency. Scotch Ales traditionally go through a long boil in the kettle for a caramelization of the wort. 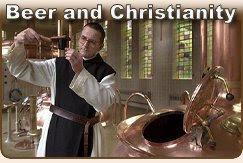 This produces a deep copper to brown in colored brew. Compared to Scottish Ales, they'll be sweeter and fuller-bodied, and of course higher in alcohol, with a much more pronounced malty caramel and roasted malt flavor. A low tea-like bitterness can be found in many examples. Best served in a "thistle" glass. 1. 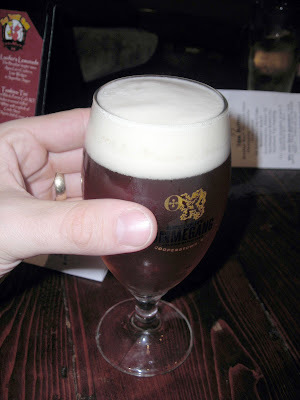 Appearance - Custom BrewCrafter's Wee Heavy had a clear burnt amber, almost red, color. topped off with a nice head. 3. Taste - Custom BrewCrafters struck a good balance here with heavy malt, perhaps caramelized, roasted flavoring while maintaining a satisfying 'hoppiness'. 4. Mouthfeel - This medium to heavy beer goes down easy (maybe too easy) with fair amount of carbonation that never threatens to overpower the flavor of the beer. 5. Drinkability - Overall this is a good solid beer, very drinkable, but you must be careful, it's no session beer. Over indulgence here would require a ride home. Remember folks, drink quality beer and do so in moderation. Drinkability Scale from 1- 10: A strong 8. 1. Appearance - Crystal-clear amber color with a light but full head. Appears crisp and consistent with a good English Ale (or apparently a Scottish one). Lacks the common red/copper tinge of a Scottish Ale. 2. Smell - Smells like a brewery! The smell is crisp and also consistent with a classic English Ale (Read: Bass). There is a malty sweetness somewhat overshadowed by the smell of fermented yeast. While not the most beautiful smell, it does imply a good drinking beer. 3. Taste - The flavor is crisp with a good mix of bitterness and sweetness. The malt dimension is somewhat toasty but not over powering. Still, all I can think of is Bass. This is your all-around good beer as it does not particularly stand out but is very tasty and refreshing. Any 'Beer Drinker" would surely appreciate this and consider it a baseline or stand-by for any occasion. 4. Mouthfeel - This mouthfeel is light, crisp, and smooth. No lingering consistency an the carbonation levels are right-on. 5. Drinkability - This beer is very good. I could drink it all night and would recommend it wholly to anyone. While I don't want to admit it is as good (or better than) Bass, it may be..
Drinkability Scale from 1- 10: A 9. The week before Thanksgiving, I headed up to up-state New York to visit my brother and his family for an early Thanksgiving with my father. We had a blast! But it wasn't all turkey and and football, there was beer too. I brought up the rest of my English Pale Ale so my father, brother and his beer loving neighbor could give it a try. My Dad wasn't crazy about the beer, he's not much of a beer drinker, but my brother and his buddy seemed to like it well enough. I did a little beer-recon before heading up and found a short list of breweries in the area. The only one I found that was really close and open on Sunday was Custom BrewCrafters, out of Honeoye Falls, New York. Just a short drive from my brother's town. So off we went for a little father-son-brother bonding. Custom BrewCrafters was easy to find, but also easy to miss. You have to drive all the way to the end of a dead end street in a residential area before you see the truck above parked in a lot across from a grade school. The brewery is just around the corner at the far end of the lot. They've recently started the construction of a new facility, bigger and better, so I'm thinking the new home of Custom BrewCrafters maybe less hidden. Me and Dad pose for a quick shot before entering the brewery. We almost look like we were in uniform or something, I swear we didn't plan our outfits together. What can I say, Dad and I are snappy dressers! Before starting the tour, we were offered a few free samples to take with us on the tour. We started with the Canadaigua Lake Ale, which was a nice smooth yet sweet ale, definitely something I could have a number of in one session. Now I didn't take the time to write up a proper review of any of the free samples I had that day, I don't think Mark and Dad were quite ready for that level of involvement just yet. Dad gave the Wee Bitter a sip. He wasn't a big fan, although he doesn't really drink, so that's not really a fair critique of the beer. Dad was more into beer back in his youth. Dad confided in me that as a young Marine, he enjoyed the occasional Miller, and I've heard him mention Pabst Blue Ribbon in the past. Cut the man some slack, it was a different time, and there was a lack of quality beer available to him. He was more or less humoring me on this little excursion, thanks Dad you're a good sport! Our tour guide (I can't remember his name) gave us a thorough walk through on how the brewing process worked. This was the most detailed walk through I've seen so far during a tour. But then again, it was just the three of us in the audience and the place is very small. Our guide told us a little about the impact the hops shortage is having on their products. They've had to cut back on some of the hops in some of their beers this year. They actually have their beers reviewed with vintages. Beer Advocate shows three different years for their Wee Heavy, for example. Apparently the die hard fans of Custom BrewCrafters can tell the difference, but they still stand by their products as quality crafted beers. The only beer I tried that I did not like was the one our guide warned me about. It was their Christmas Ale. It tasted like a beer with a candy cane in it. Not a good choice... Everything else was quite enjoyable. Custom BrewCrafters has a pretty cool business model. 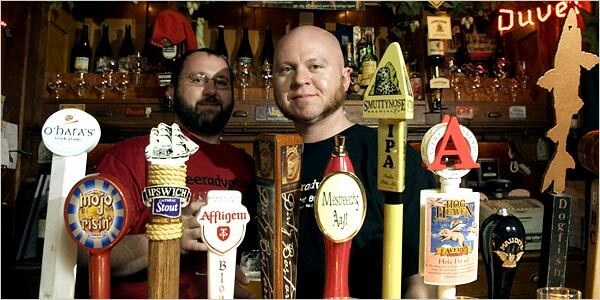 They brew custom beers for local restaurants and pubs, keg them and let their customers sell them off the tap as their own brews. They also make some beers for themselves and sell just about everything they make right there off the brewery's tasting room. Our guide was kind enough to let me shoot some images inside the large stainless steel kettles. When I saw the open hatch, I couldn't resist! Once again I couldn't help but think of that scene from Strange Brew. I call this one, "inside the belly of the beast!"... I wanted to get some one to take a photo from up top of me sticking my fat head in there, but I didn't want to push my luck or cause any contamination. Here's a shot of the breweries hot water tank, that feeds (you guessed it) hot water to the brewing vats. I could use one of these at my house for showers let alone brewing. Custom BrewCrafters pride themselves on their local water source. Keep in mind this place is nestled in the famous finger lakes area and just south of the Great Lakes. Although I didn't take the time to write any reviews of their beers I sampled that day, I purchased a growler of their Scotch Ale, Wee Bitter. 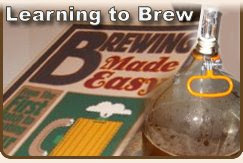 (Beer Advocates details on the brew) Now that's good stuff! I'll post a review of the beer very soon, I promise! By the time we finished our tour there was a line of loyal customers waiting to get their growlers filled. Some folks were getting boxes filled, including some Custom BrewCrafter fans that were heading out for some pre-game tailgating before a big Buffalo game. All in all it was a great trip and so close to my brother's house that I may visit the brewery every time I go up to see the family. Can't wait to see the new facility! If you recall, I struck up a bit of a conversation with Josh Mishell from Flying Dog Brewery via blog comments and email last month. Josh was kind enough to agree to send me a sample (for reviewing purposes) of Wild Dog Doppelbock, AKA the Collaborator, after I commented on how cool I thought the whole Open Source Beer Project was. It was pretty funny, I was so excited to see the box when I got home from the gym, I didn't even wait to shower and change before I ripped open the box. My wife thought it was a little tacky for me to post a photo with my sweaty workout clothes on, but I say BAH! I was like a kid on Christmas, and I can't wait to try out my new toys! 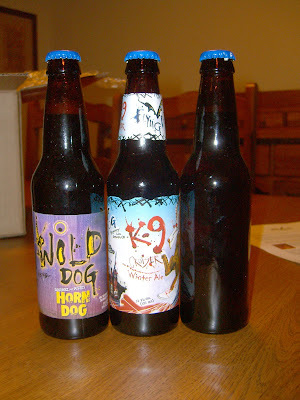 Also, Stephanie was kind enough to offer me an opportunity to interview Flying Dog Brewery's Head Brewer, Matt Brophy. I intend on taking her up on the offer, and here's where you come in.